Last Saturday there was a very successful server training day in Reading, organised by the Society of St Tarcisius. 17 priests, MCs and trainees gathered at St John Fisher House, the house of the Fraternity of St Peter in Reading, for the occasion. We can now announce another training day, this time in York. Server training in Oxford in the spring. 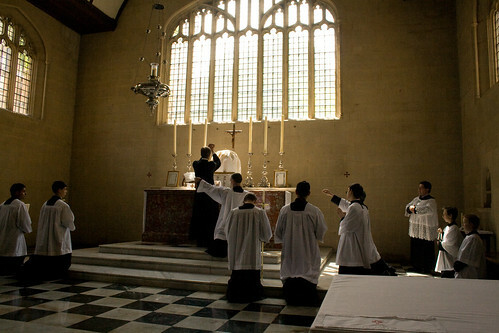 The Sodality of St Tarcisius will be holding a server training day at the Church of the English Martyrs in York on Saturday 12th February 2011. It will run from 10.30am and conclude with Mass at 4pm. The day will be suitable for men and boys who are beginners as well as servers who have some experience. Tuition will be given in Latin pronunciation as well as the practical aspects of serving, and will be tailored to the requirements of the participants. Participants are asked to bring their own lunch, although tea and coffee will be provided. There will be no charge. Anyone interested in attending is asked to contact Paul Waddington by e-mail on paul@gooleboathouse.co.uk.